A must make for cookouts! 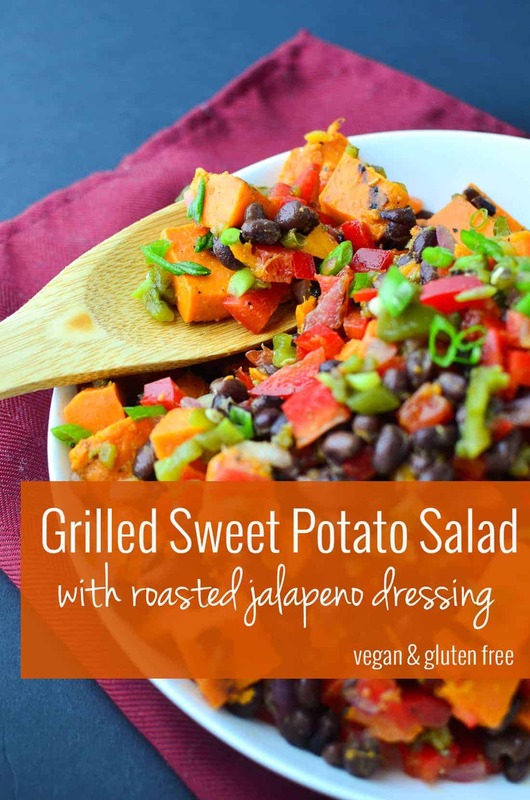 Grilled Sweet Potato Salad with roasted jalapeno dressing. I turn 30 this upcoming Sunday, and it feels like a long time coming. In fact, for the greater part of this year, whenever anyone would ask me how old I am, I would generally respond with “30”. It’s not that I want to rush my life, but I’ve never felt more adult than I have in the last few years leading up to this birthday. I got married, started my own business, and am gearing up for the next adventure: moving from California to St. Louis. I feel a long way from the person I was in my early 20s and cannot wait to see what the next decade brings. In fact, after BL and I decided that we would be relocating for his new job, I made a decision that I couldn’t be more excited about. I will be leaving my full-time job at the University of the Pacific this summer and working exclusively on building my private practice. I am beyond excited for this opportunity, and I owe a lot of that to you and this space. I am thankful that I don’t have to “wait-list” clients anymore and can spend more time on the projects I am most passionate about: helping others find their healthiest food relationship, mindful eating, and vegetarian cooking. Stay tuned as I revamp my services and offer more online packages for everyone to enjoy. I’m not naive to the fact that it’s going to be challenging, difficult, and outside my comfort zone, but I am beyond excited to take that next step. In California, May evenings are warm, but not overly hot- the perfect temperature for firing up the grill and enjoying a relaxing dinner outside. My birthday is typically around the time when I officially feel ready for summer- the semester has ended and I want to spend as much time as I can outdoors. Grill season, I am more than ready for you! As a vegetarian, people often think that you’re limited in grilled foods but that couldn’t be further from the truth! I think I’ve put just about every vegetable on our baby Weber and love the smoky, earthy taste that grilled vegetables become. These sweet potatoes are no exception. Grilled sweet potato chunks get tossed with a grilled red onion & jalapeno dressing, making this the perfect side dish to any cookout this year. I originally bought a bag of sweet potatoes to make my Sweet Potato & Black Bean Burgers but then laziness set in. Which is pretty typical when the sun is out as all my desire to stand in a kitchen and cook rapidly disappears. While I wasn’t in the mood for crafting handmade burger patties, I was still craving meaty sweet potatoes and spice. This salad nailed it. The creamy sweet potatoes soak up all of the spicy jalapeno dressing, negating any need for mayo, sour cream, or other heavy binders. I loved this warm right off the grill, but the flavor only intensifies the longer it sits. Warm, room temp, or cold, this salad is a summer evening winner. Place the potatoes in a large pot and cover with water. Bring to a boil, reduce to a simmer and cook until just tender, about 15-20 minutes. Drain potatoes and let cool. The skins should slip off but if not, gently slice them off. Cut into 1″ thick slices and brush with 1 tsp. olive oil. Place on the grill and cool for 2-3 minutes per side. Remove and cut into large dice. Set aside. Brush the onion slices and jalapenos with 1/2 tsp. olive oil. Place on the grill and cook for 5 minutes until skin is blistered. Remove from grill, let cool slightly, and rub off jalapeno skins and seeds. Finely dice the jalapeno and red onion in a separate bowl. Add in the rest of the ingredients: lime juice, chili flakes, cumin, oregano, maple syrup. Drizzle in the olive oil and season with salt and pepper. 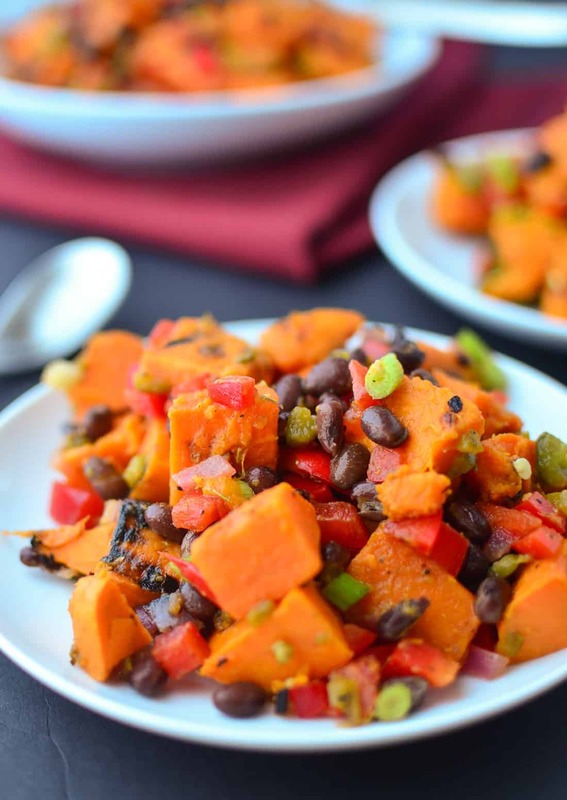 Add the red pepper, black beans, and cilantro in the sweet potato bowl. Gently toss with dressing. Cover and let stand for at least 30 minutes. Serve! Such a beautiful mix of hearty flavors and colors! Happy early Birthday! That’s awesome you’ll be moving forward with you practice-can’t wait to hear more about it and best of luck to you! Grilled sweet potatoes!? Genius! Oh man the sudden rush of not having the desire to cook. I know the feeling! 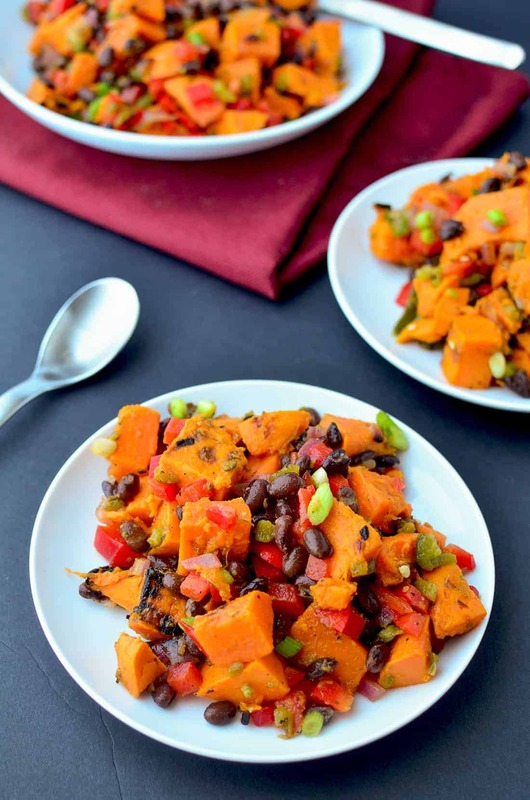 but this grilled sweet potato salad sounds right up our alley…especially on those nights my husband feels like making dinner on the grill! That’s what I figured! You can make this entire dish on the grill, right along with whatever else you are cooking. How exciting! 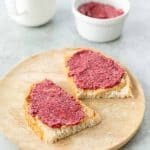 Best of luck on the new journey ahead – change is always a good thing 🙂 I am definitely ready for a cookout after seeing this recipe. YUM. Thanks Min! I’m actually really excited to turn 30! Bring on the next decade 🙂 Hope you enjoy the recipe! I’m so excited for you and can’t wait to see what you do! Thanks Deanna! I’m super excited 🙂 Can’t wait to see you in September! I wish I had this yesterday! And Happy Birthday dear! You are one lovely woman! I love grilled sweet potatoes! It gives them such a great flavor. Hope you have wonderful birthday! This hits all the marks for me! 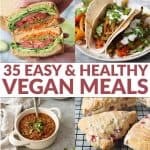 Plus- it’s incredibly healthy! First of all, happy early birthday! I’m excited for your new adventure, and you’ll have to keep us in the loop on new things that are going on! Happy almost 30th! I think 30 was one of my favorite years ever 🙂 This sweet potato salad has me wanting a grill real, real bad–and that dressing sounds ridiculously good! This looks yummy. I noticed, though, in the picture it looks like it has scallions or green onion, but that’s not listed in the ingredients. Should it be? Great catch! Yes, I must have forgotten to add them! I just updated it- should be about 1/4 cup finely chopped scallions. Thanks!